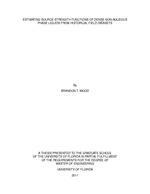 Environmental Engineering Sciences thesis, M.E. Dense non-aqueous phase liquids (DNAPLs) pose a number of challenges in groundwater remediation design as well as prediction of contaminant fate. Previousiresearch has suggested that flux based analysis may more closely relate a contaminant source zone to plume evolution and analysis of risk to human health and the environment. Several mathematical models have been developed to relate DNAPL mass and spatial distribution to contaminant mass flux. These functions were coupled with plume evolution models in order to assess their applicability to field settings using historical field data sets. These coupled solutions were used in an optimization framework in order to assess the applicability of source strength functions to field sites and the feasibility of characterizing a DNAPL source zone with historical data, mainly in the form of contaminant plume information both temporally and spatially. An efficient optimization technique, evolutionary optimization or genetic algorithm optimization was used to parameterize source strength functions for both known (synthetically generated data with known conditions) and unknown (field sites) historical datasets of various temporal record duration and resolution. This allowed for effective and accurate parameterization of source information for synthetically generated data, but due to the limitations of the analytical solutions to describe solute transport at field sites, failed to accurately parameterize certain cases. It is suggested that transport solutions that more accurately describe field settings are required for this type of analysis. Thesis (M.E.) --University of Florida, 2011.